Politicians and dignitaries emerged in a sombre mood from the meeting house at Waitangi earlier this month, after a local kaumatua stood up and pronounced that a major city would soon be destroyed by an earthquake. 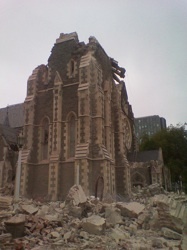 This week New Zealand experienced its worst natural disaster of modern times when Christchurch, our second largest city, was badly damaged by a devastating quake. After a tough year in 2010, this event is likely to have severe repercussions for the entire nation both in economic terms and for morale in general. It was bad enough that Christchurch took a hit in September, but this event is much worse. Officials are already talking about the possibility of a final death toll in the hundreds and over $6 billion in repairs being needed for the stricken city. Residents must be shocked at how their lives have been turned upside down. For the rest of us, the situation seems surreal and we feel powerless to assist. But this is the scenario we’ve been taught to prepare for all our lives. We just never expected it to happen in the garden city. Seismic and volcanic upheavals are a fact of life in a country like ours; we sit astride two very active tectonic plates. The forces that built this land can also destroy it. In the short term, the remainder of the nation will need to step up to support our southern cousins. That could mean some form of additional taxation. It will almost certainly mean a dent in our fragile economic recovery. Apart from the pure financial cost, it is hard to focus on productive work when friends and family are suffering and horrifying images of destruction are being broadcast into our homes. If we are to help Christchurch rebuild, we must ensure economic growth continues throughout New Zealand. * We’ve compiled a list of web-based resources on the iWantMyName NZ blog, for anyone who is worried about missing persons or is keen to help in some way.